“Friendly Persuasion” is old enough to star Gary Cooper, and I doubt many people are aware of it. The plot is based loosely off of the short stories written by Jessamyn West about a respectable Quaker family, the Birdwells, living during the throes of the American Civil War. As Quakers, they are pacifists, and live by strict principles that include no music, frivolity, gambling, dancing, or drinking. This family is portrayed in such a way that watchers are encouraged to view the community both sympathetically and as an oddity. One scene compares they grey, reserved, quiet Quaker meeting with the joyous, colorful, mainstream congregation just down the road. What is striking is that both forms and styles of worship, while contrasted, are not condemned. How often does a Christian film do that? After setting up the principles of this community to the audience, and some foreshadowing concerning the effects of war on pacifists, the film goes on for a wonderful romp where you see this family break almost every principle they represent–and get away with it. Seriously, you’ll have so much fun watching this family sneak music, racing, and deception into their lives, that you’ll wonder how this could be construed as an uplifting movie. By the third act, the fun ends as the battlefield arrives. Joshua Birdwell, the eldest son and the one family member feeling convicted to join the fighting to defend his beliefs and family, takes up his gun and goes to war. Jess (Gary Cooper), the father, leaves the house with his own gun to find and defend Joshua. Everything has been building up to the question of how far can one break one’s principles, even morals? Things are set up to facilitate lots of pressure and sympathy for violence. Jess, having been pressed by friends and neighbors to defend the community by force, arrives at the field to find their corpses and then gets attacked himself–by a looter. Surrounded by dead members of his community, unsure about whether his own son is one of them, Jess is attacked by a man lingering around to pick the merchandise off their bodies. Driven by revenge, self-defense, and anger, Jess pins the confederate straggler at gunpoint. He has every seed for violent action planted in himself. At the very moment when the audience is rooting for blood, Jess Birdwell remembers himself and the morals he holds greater than himself, and lets the man go. Joshua is found wounded both physically and emotionally from the fight–the first consequence we see in the movie to a trespass–yet he is treated with mercy and understanding. Other shenanigans happen at home as the household survives looting, but that scene with Jess Birdwell is the great climax that would apply to all Christians. Even as we live out our imperfect lives, finding how easy and fun it is to compromise, can we grab a hold of ourselves and remember the higher standard and meaning we are called to? In the face of pressure and every seeming justification? Perhaps the connection of these convictions to a belief in God, rather than just a way of life, is too implicit for Christians to laud of “Friendly Persuasion.” I think the ability to make outsiders feel and understand these convictions is what makes this movie a success. “Lilies of the Field” is a beautiful movie and an amazing Christian film. I do not know if its creator was Christian, but it has a genuine kindness towards the religion. This one explicitly bases its story in faith to God, and yet keeps the story light and accessible by not muddying it up with heavy-handed emotions or spectacle. Sidney Poitier plays Homer Smith, a traveling construction worker who happens across a tiny community of German nuns in the middle of dry farmland. At first only passing “thataway,” he gets drawn into building a chapel for them and the surrounding community, despite there being no resources to do so. There are so many other themes in here to enrich this core story too: racism, snobbery, entitlement, and pride. The Mother Superior has to learn that God’s Will does not override common courtesy and respect for one another. How many Christians in doing God’s Will (and note there are no quotation marks there, no sarcasm) forget to treat their peers as individuals and not minions? In what I’m featuring here, this movie is the most overtly pro-Christian, and yet it is so gentle and cheerful in its communication that no one would mind watching it. It doesn’t get heavy-handed, it doesn’t quote its philosophy all in one dramatic line like a PSA, it doesn’t equate “God will provide” to “God will iron out your life’s kinks,” and it doesn’t try to force every trope into the mix (note the absence of a mopey girlfriend, and it never trudges out the “temptation” plot device with the nuns). It’s meaningful and a sheer delight. “Chariots of Fire” is perhaps one of my favorite movies ever. 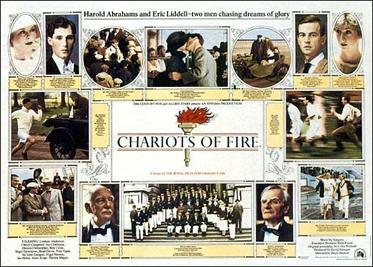 Eric Liddell’s famous story has been told in a number of heavy-handed books and this movie could’ve easily become another soppy, tactless sales plug for “be-a-Christian-because-this-guy-is-awesome.” This film handles it in the most stellar way, and I credit this to the fact that its makers were not out to tell a Christian story; Liddell’s story shines through by its own virtue. The greater story is really about two men out to prove their convictions through running at the Olympic games, and the director respected Liddell’s convictions by directly linking them to his faith. Christians who watch the film can’t help but root for Liddell because of his faith, but ironically have to face the fact that his veneration of the Sabbath is far more extreme than or even alien to what most Christians practice. Again, it’s a good reminder that their is strong diversity in Christian beliefs, but that we are unified by faith more than the letters of our theology. What is more interesting to me, and utterly lacking in most Christian cinema, is that the film shows a very factual portrayal of the Christian community. The second hero of the film, Harold Abrahams, is a Jew who struggles against the racial and religious prejudices of the 1920’s Anglo-Christian-institution. He runs in order to prove to the world that he can beat them, and wants that gold medal so that no one can deny it. In Harold’s words: “This England…is Christian and Anglo-Saxon, and so are her corridors of power. And those who stalk them guard them with jealousy and venom.” And the movie follows through to show these Anglo-Christians denigrate Harold and his ambitions. Although we might snub these men of power as “not true Christians,” we have to grapple with the fact that they worship our God in the same way we do, and that they lead our communities with a rhetoric that blends into and influences our own. Through Liddell we see genuine, practical, honest Christian faith. Through Abrahams we see what an ugly world Christians can create. Christians would testify that this is a failing, but it is a very real failing that has affected the Church throughout its life. Again, too many Christian films forget to portray the larger community of Christians, and that not all our representatives are the upstanding members we wish them to be. Not acknowledging this is a form of hypocrisy. This film makes a beautiful complement to my previous two films listed because it deals with holding to your convictions and also to broadening up one’s view of God’s will. It’s a pity that they portray Liddell’s sister as a wet-blanket character, but at least her role highlights that Liddell saw God’s work in any task, even running. By the end of the movie, the sister comes to realize that and comes out in support. There are other Christian films out there that I haven’t seen, but am assured they are praiseworthy. I understand “The Mission” is intense and well done, but I haven’t seen it. If you have any good movies you’d like to recommend, leave a comment below. If you have some movies that you are perhaps wondering why I’d object to (ex. “God’s Not Dead”, “Facing the Giants”, “Courageous”), then also leave a comment. If there’s enough interest, I’ll make it another post to break down the dysfunction in these films. As it is, other sources have already done so for me and I don’t feel too great a need to recap their content. Next Article “For women,” eh?